In 2012, just over half of all Internet traffic came from bots and, according to the latest data from security CDN service Incapsula, this year the number has increased to 61.5 percent. 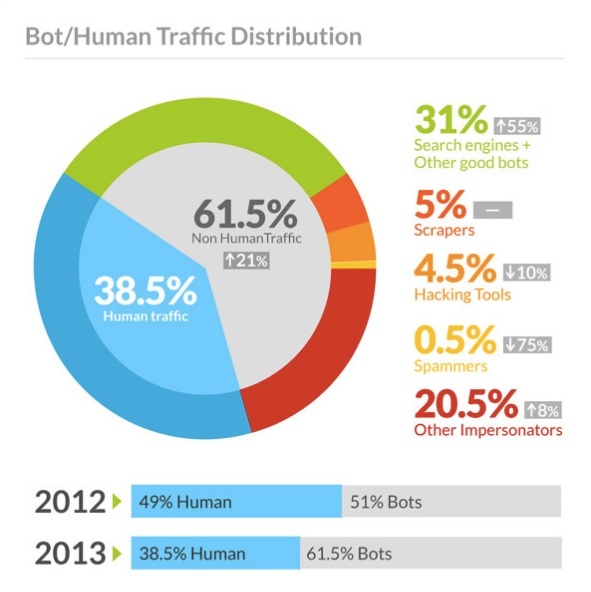 At first glance, this sounds like this means the number of nefarious attacks is up, but Incapsula actually notes that the bulk of growth in this number is due to what it calls “good bots.” Visits from certified agents from search engines and similar tools increased from 20 percent to 31 percent, for example. According to Incapsula, many search engines have lately increased their sampling rates. In addition, the SEO tools that try to help websites rank higher once they are crawled, also now often visit sites more often than ever before. About a third of bots, the company argues, are malicious, but thanks to Google’s Penguin update making comment spam relatively useless as an SEO technique, the number of spam bots has decreased from 2 percent in 2012 to just 0.5 percent this year. One thing to note here is that Incapsula gathered this data by looking at stats from its own 20,000 customers. The companies that sign up for the kinds of security services the company offers may not be exactly representative of the Internet as a whole. Not every site, for example, has to deal with regular DDoS attacks and needs Incapsula to mitigate these. Still, the company’s data clearly shows that the number of bots is on the rise, though the numbers for your own site will likely be quite a bit different.